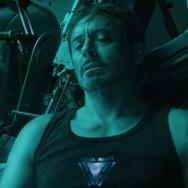 Here at Comics on Film, we know just how impatient fandom can be when it comes to the most beloved superheroes in the world, and an uncertain cinematic future for them. When talking about beloved superheroes, the conversation will inevitably turn to DC Comics' Dark Knight, Batman, the most popular hero in the entire stable that features his fellow do-gooders in the Justice League. Batman's cinematic future seems to have far more question marks surrounding it than he's had since the early 2000's, primarily due to the lukewarm critical and commercial receptions that his most recent appearances on the big screen have come with. Critics and audiences seemed to be satisfied with Ben Affleck's first performance as Bruce Wayne, but the movie in which that performance was featured was hammered for a number of varying reasons, depending on the critic. While last year's Justice League was generally better received when compared with both Batman v Superman: Dawn of Justice and Suicide Squad, it didn't perform well financially, and some fans have gone out of their way to criticize Affleck for "phoning it in" from their perspectives. Add to that the swirling persistence of rumors, without confirmation, that Affleck is on his way out as Batman, and you're left with far more questions and suppositions than you are facts and certainty. Still, all indications are that director Matt Reeves will indeed be making his own Batman film, and one of the more recent rumors is certainly what we'd call a "doozy." According to tweets from Variety's Justin Kroll (via Batman-On-Film), the current scuttlebutt seems to point to classic Batman villain the Penguin being a prominent antagonist in WB's upcoming Birds of Prey film and/or in Reeves' Batman film. 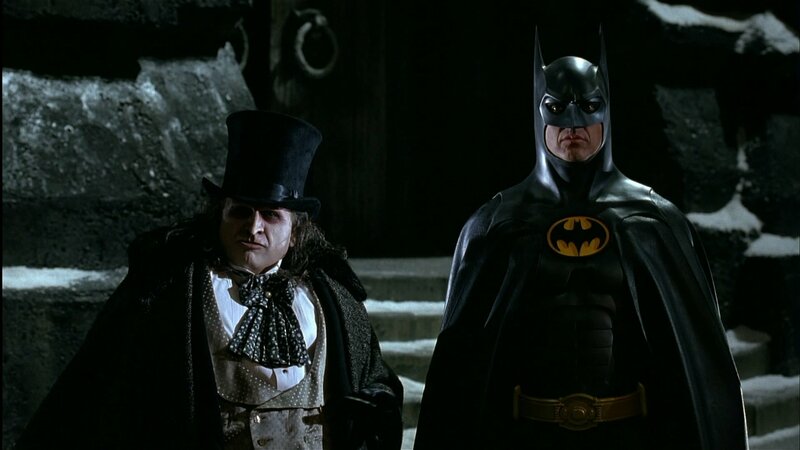 Although he's generally recognized in wider pop culture as one of Batman's most notable adversaries, the Penguin's legacy on film is a little hit or miss, at least when trying to find a portrayal that actually legitimately represents the kind of threat he presents to the Dark Knight of the modern comics. 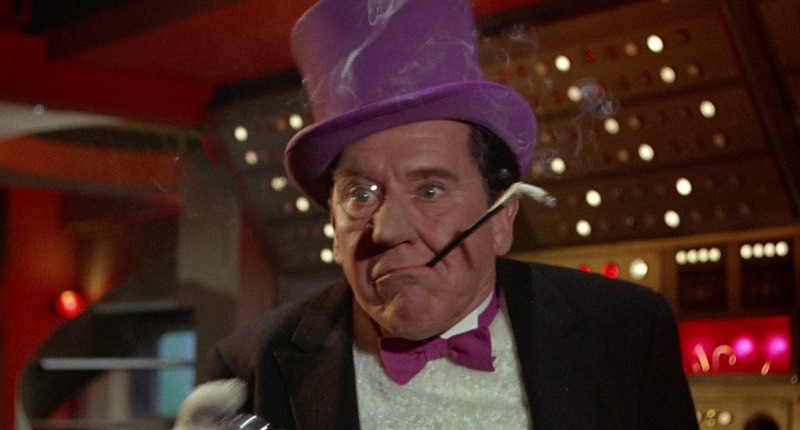 In live-action, Burgess Meredith famously portrayed the Penguin in an ongoing capacity throughout all three seasons of the original Batman TV series starring Adam West, as well as the feature film that spun out of that show in 1966 (see top photo). When it comes to film, even though that iteration was largely a campy and comedic take on the characters and the material, the Penguin in that version may actually be the closest we've gotten to a true adaptation of the comics character. In 1992, of course, Danny DeVito portrayed a ghastly, monstrous version of the Penguin in Tim Burton's Batman Returns (above). Burton and screenwriter Daniel Waters created a version of the character that was a pretty major deviation from the Penguin of the comics. 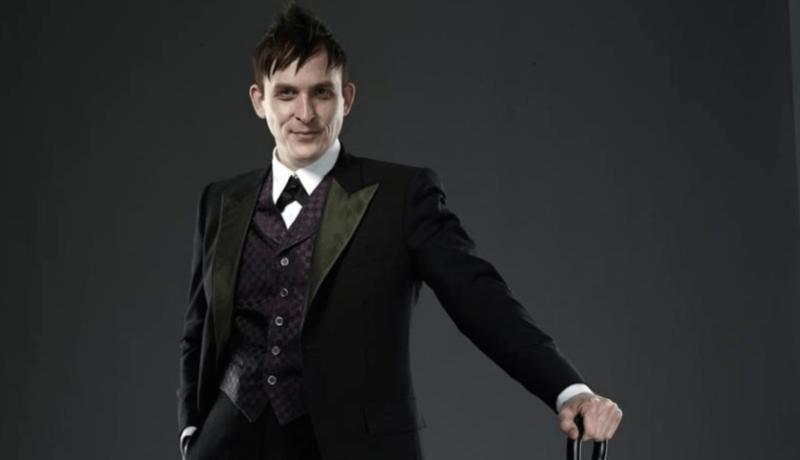 The most recent live-action vision of the Penguin is back on the small screen, with actor Robin Lord Taylor playing a pre-Penguin Oswald Cobblepot on the Fox TV series Gotham (above). 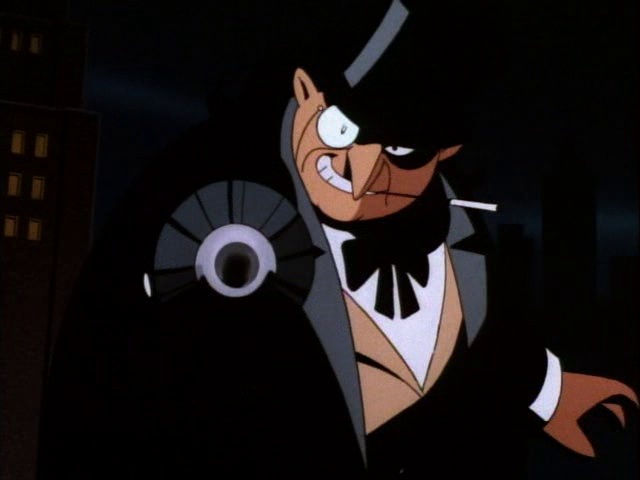 Taylor's version is generally closer to the Penguin of the comics due to his close relationship with organized crime, but this version of the character is also generally far more eccentric. So far, the best and closest vision of the Penguin in other media arrived, unsurprisingly, in animation. Specifically, when singer Paul Williams provided his voice in Batman: The Animated Series and its follow-up, The New Batman Adventures. Williams provided an intellect and a menace to the Penguin that made him an eminently unique adversary, and one of the highlights of that show overall. Props are also owed to voice actor Nolan North's unique conception of the Penguin in the interactive medium, where he voiced a vicious, cockney-accented version of the crime boss in the Batman: Arkham video games. Could the Penguin Fit Into the DCEU? There's not much of a question surrounding the idea that the Penguin could most definitely use a little more TLC in terms of properly adapting him in live-action and the DCEU would likely be the perfect place to do that. However, it's also pretty easy to imagine that the idea of the Penguin returning to the realm of the Batman feature films may come with some collective groans from movie audiences, considering that, comparatively, we've seen the Penguin a lot more than other, less utilized Batman villains. 1) Adapt the character as he is in modern comics: two major stories come to mind in terms of providing a really solid roadmap to adapting the very real threat that the Penguin can represent in Batman's world, at his best. "He Who Laughs Last...!" was the title of a story from a one-shot published in 2008 as Joker's Asylum: Penguin #1. Written by current high-profile Marvel writer Jason Aaron with artwork by Jason Pearson, that story did a wonderful job of painting a somewhat sympathetic picture of young Oswald Cobblepot before delving deeply into what makes him vicious, sadistic and deadly. The other story is a five-issue mini-series from 2011 called Penguin: Pain and Prejudice, written by Gregg Hurwitz with beautiful painted art by Szymon Kudranski. Aspects of Oswald's character on Gotham are partially inspired by this story, concerning the relationship between he and his mother, but the comic book story takes things significantly further by putting a solid emphasis on Oswald's obsessiveness, his attachment, and most importantly, what actually makes a squat, overweight man in a top hat a worthy adversary of the World's Greatest Detective. These two stories would be a great roadmap toward giving the Penguin an adaptive treatment that he most definitely deserves. 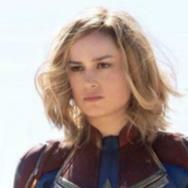 2) Cast an actor that gets peoples' attention: perhaps the most pivotal element needed to get people excited about the Penguin, finding an actor who can provide the proper weight, truthfulness, and menace that those above-mentioned stories perpetuate would be key to carving out a more truthful, positive cinematic legacy for the character alongside some of Batman's more cinemaically well-regarded adversaries. These two factors would likely go a long way toward making the Penguin become a viable presence in future DC Comics films, by making him threatening and interesting. What do you think? Does the idea of more Penguin in a future Batman movie excite you? 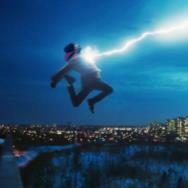 Be sure to leave a comment and chime in, and we'll see you with a new Comics on Film next week! Chris Clow is a comics expert/former retailer, and pop culture critic/commentator. He hosts two podcasts: Discovery Debrief: A Star Trek Podcast and Comics on Consoles. Find his column "Comics on Film" weekly at Movies.com, and follow along on Twitter @ChrisClow.